I'm not sure where I saw this - I'm still digging to find the original creator so if anyone can help me give credit where credit is due I would be thrilled - but I'm sure that this simple, festive bulletin board display would compliment your holiday classroom decor, provide students and staff with a giggle, and take a minimal amount of time and effort to create! Background: Dark blue bulletin board paper. 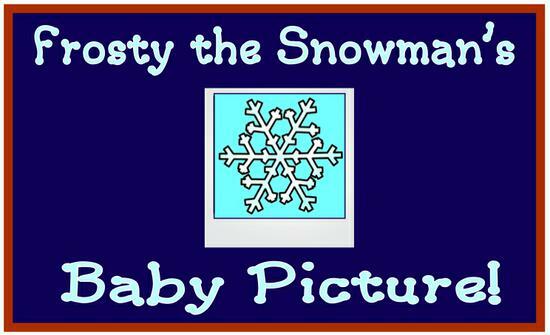 Title: "Frosty the Snowman's Baby Picture!" Border: Winter-themed border, glittery snowflake cutouts, or baby pictures of your students. Decoration: Use white and light blue (in place of black) background paper to create a "polaroid" photo. Cut a single snowflake from white bulletin board paper and mount it to the blue paper. We'd love to hear what you think of the design so be sure and leave us a comment below!